Universities minister Jo Johnson MP visited Nottingham Trent University’s Brackenhurst Campus to learn more about the hands-on opportunities available for students and the scientific research being conducted there. Universities minister Jo Johnson MP visited Nottingham Trent University’s Brackenhurst campus this week to learn more about the hands-on opportunities available for students and the scientific research being conducted there. Professor Eunice Simmons, Deputy Vice-Chancellor at NTU, welcomed the minister to the campus and introduced him to Professor Rob Mortimer, Dean of School, Julia Davies, Head of Department for Environmental Science and Gareth Starbuck, Animal Programmes Manager, who discussed the scientific research into sustainable agricultural systems which is being carried out at NTU. 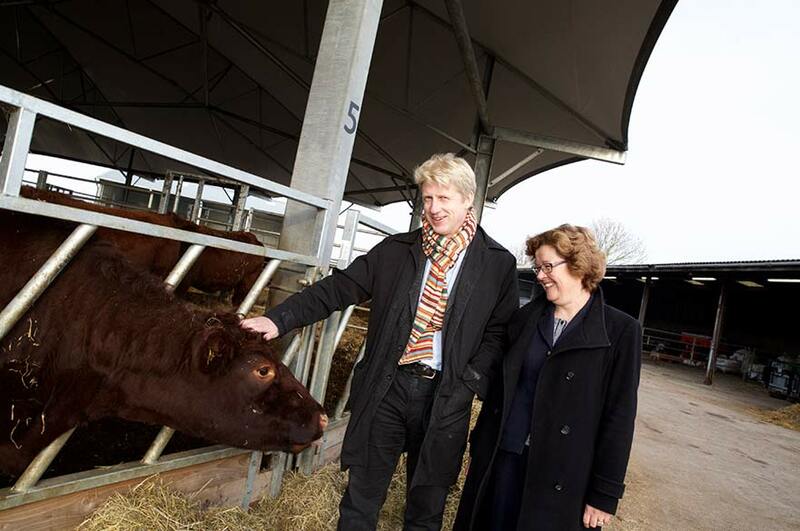 During his visit, Mr Johnson was shown the award-winning rare breed of cattle – the Lincoln Reds – at the University’s innovative Roundhouse. He also spoke to Head of Further Education, Pamela Ellis, and watched students on the BTEC Extended Diploma in Agriculture learning how to assess the condition of cattle during a practical led by a local farmer. Prof Mortimer led a tour of the School of Animal Rural and Environmental Sciences’ small animal and veterinary area before showing him the campus library and newly refurbished student union Orangery cafe. The minister also discussed elements of higher education policy with Prof Simmons, including the region’s skills needs and apprenticeships while also learning more about NTU’s work in widening participation and social mobility. Mr Johnson last visited NTU in September when he attended the Universities UK annual conference, which was hosted at the University’s City Campus.